The summer is really heating up! Spend the last few summer weekends on the beach with your nieces and nephews. Play in the sand, building huge sand castles or digging enormous holes, and head into the water to wash it off. If the beach is not an option, don’t be deterred. These five activities will help you bring the beach to them! 1. Fine Motor Skill Development: If your niece or nephew is in preschool, you know that this is a crucial time to develop their fine motor skills. Using sand can help them practice these skills in a fun, sensory way. They can knead it like dough, pick small items out of the sand, or use measuring cups to pick it up and dump it out. Have the little ones draw pictures in the sand using their fingers or Q-tips. If they are learning their letters, they can draw out their ABC’s. 2. Archaeology Dig: This is a cool and exciting way to teach kids about science. Fill a large box with sand or even just use the loose dirt outside. Bury fake dinosaur bones or “artifacts.” After explaining to them what an archaeologist does, set them up with the proper tools such as trowels, sifters, paintbrushes, and a notebook to keep records. They will love the feeling of making discoveries and being trusted with such careful work. Watch Jurassic Park to inspire them even further! 3. Kinetic Sand: Savvy Auntie gave this the Coolest Toy Award and for good reason! Kinetic sand is a sculpting material that functions like wet sand. Unlike clay, kinetic sand never dries out so your nieces and nephews can leave out their creations for days. The kids can use cookie cutters, rolling pins, and stamps (to make imprints) to spice up this activity that will keep them having fun for hours. Craft stores and most toy stores sell the sand, but here is a DIY recipe for a cheaper alternative. 4. Sand Art: This activity is timeless and easy to execute. Grab old water bottles or jars and have your niece or nephew pour layers of colored sand into them. They can keep it leveled, shake it around, or poke toothpicks in to pull the sand in different directions. You can purchase colored sand at craft stores or make it yourself. 5. Sand Paper: Get crafty with sand paper! This scratchy stuff has more uses than you might think. Give your nieces and nephews some chalk to draw on it. The grubby material will hold the chalk in place. They can mix materials by incorporating crayons and watercolors into their masterpieces. They can even make their own shirts using sand paper. Tell them to color on a page using crayons. Place the page sandy side down on a blank T-shirt, lay a sheet of wax paper on top of that, and run an iron along the back for about thirty seconds and Voila! 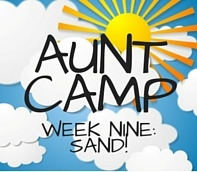 Home Activities AUNT CAMP 9: Sand!